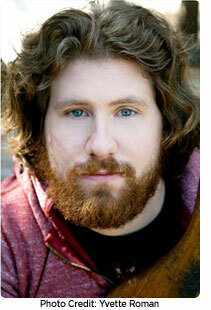 Casey Abrams is interested in more than just singing in his signature smooth and bluesy style. This favorite former American Idol contestant created a unique music video to uplift all those living with Inflammatory Bowel Disease or IBD, as a part of his continued effort to create awareness about Crohn's disease and ulcerative colitis. Both conditions are IBDs that create chronic inflammation in different parts of the digestive tract. Living with these conditions can be extremely painful, and sometimes even life-threatening. This musician, whose style is a hybrid of jazz, blues, and pop, understands the difficulties that come from living with a condition very few people understand or even know about. "It's a harsh disease—I had no idea what it was," says Abrams. Now, his goal is to get information about IBD out to the public. In addition to IBD Icons and performing at last year's Las Vegas Rock and Roll Half-Marathon and Marathon, he wrote a song to empower and encourage those living with IBD. To watch to this fun and catchy video, become a fan of IBD Icons. For every person who becomes a fan, one dollar will be donated to the Crohn's and Colitis Foundation of America for research and education. But Abrams doesn't want to stop there. He's cites the lead guitarist of Pearl Jam, Mike McCready, as one inspiration. McCready lives with Crohn's disease and regularly performs benefit concerts to raise IBD awareness. Abrams's isn't the only health activist in his family, Pamela Pierce, Abrams's mother, received a "Woman of Distinction" award from the Crohn's & Colitis Foundation of America. This was a very proud moment for him, which fuels his passion for the cause. Abrams met with one of the IBD Icon winners, Doug from Glendale, CA, who lives with Crohn's disease. "It's awesome. Doug is doing things in Congress." Doug went to Washington D.C. to speak with senators and representatives as an advocate for the Digestive Disease National Coalition about IBD research and awareness. In regards to how Abrams is handling his ulcerative colitis symptoms, he reports, "I've had no symptoms in eight months." Abrams has been able to keep symptoms under control by eating well, exercising, and by keeping his stress levels as low as possible, even while creating his first, self-titled album (which is currently available). He only had one flare up while on tour in the Philippines. "It wasn't the best for my colon," he said. But he was able to manage it and continue the tour. With his newest album, Abrams says his goal was to "talk about things no one talks about." One of his songs is titled "Shoes." This example of how Abrams likes to engage his audience by talking about things people can identify with follows the same approach he took in creating his personal song about living with IBD. Katie, from Kansas City, MO was also a 2011 IBD Icons winner. She has ulcerative colitis and is the Team Challenge chair of Kansas City's chapter of Crohn's & Colitis Foundation of America (CCFA).